In March 2012 Dr Angelique Edmonds led a collaborative team of partners in the design and delivery of a Child and Youth Friendly City (CYFC) Forum. As one of the Premier’s objectives, South Australia is moving towards being Australia’s first Child and Youth Friendly accredited region. Driven by the need to broaden the understanding of appropriate engagement methods for seeking the input of children & youth, the Forum brought together specialists from sectors who don’t often have the opportunity to work together. This project demonstrates the value of interdisciplinary collaboration, and the importance of engaging children and young people in the decisions which affect their lives. The methods demonstrated are consistent with our approach at the School for Creating Change in celebrating the agency of every citizen, and enabling their capacity to contribute to public life. The Forum demonstrated exemplars for engaging with children and young people, allowing them to take part in decision making about the built environment, and in the decisions which affect their lives. In the lead-up to the Forum, 5000+ and the project partners engaged with year 4/5 children at Sturt Street Community School, and the year 6/7 class at Gilles Street Primary School, using a tool called ‘Spaceshaper’ – a community engagement tool developed by the Commission for Architecture and the Built Environment (CABE) in the UK. The purpose of this work was to engage the children and develop their capacity to speak about the design of their environment– so that they are confident when consulted with by adults who seek their views on whether proposals are child and youth friendly. Twelve students were invited to the Forum as an expert panel of young people, and in front of an audience of 130 adults, participated in an ‘in conversation’ session led by Department for Education and Child Development Chief Executive, Keith Bartley. The Forum also included two Spaceshaper workshops focusing upon a local reserve which was facing an upgrade. The Gibson Street Reserve is on the perimeter of the significant medium density housing Bowden development, and as such will be a critical public space to integrate the new development within its existing neighbourhood. A 4-hour workshop with Brompton Primary School sought feedback from 9-14 year olds regarding the Reserve, and how they rated its performance for their needs. In the evening of the same day, a 4-hour workshop was held with a group of local residents, design professionals, and observers interested to see the demonstration of the tool. Shaping Space by Engagement from Office for Design + Architecture on Vimeo. 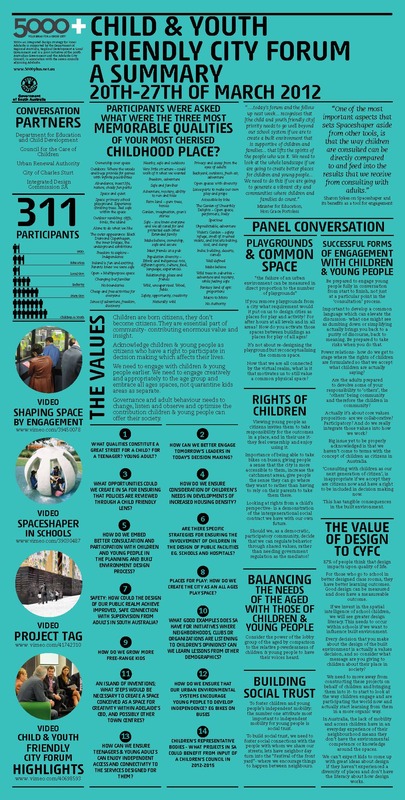 Child and Youth Friendly City Forum Highlights from Office for Design + Architecture on Vimeo. Spaceshaper in Schools from Office for Design + Architecture on Vimeo.